Set of 3 Baby Shower Pink Badges perfect for gift bags & keepsakes from your girly pink baby shower. 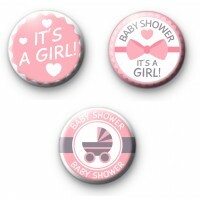 A button badge is a sweet way to announce the gender of your baby. You get three baby pink badges in this set all pink themed.